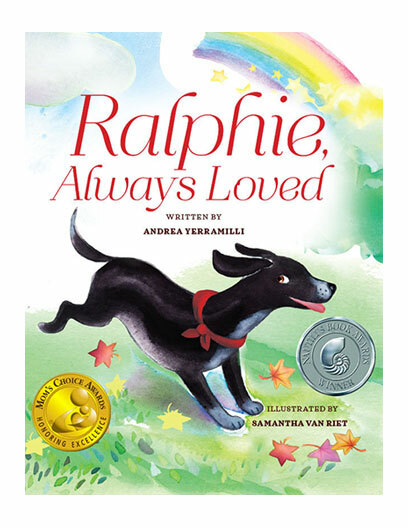 Beautifully illustrated in full color, Ralphie, Always Loved celebrates the life of a dog who perfected the art of loving and reminds us that love never ends. Ralphie had been returned to the shelter three times when Andrea Yerramilli and her husband adopted him. He was rambunctious and hyperactive, it was by no means certain that he would ever be appreciated for the loving dog he was. But when he was taken home to a loving environment, understood, redirected, taught, and accepted, he learned fast. Ralphie, Always Loved wins 2017 Silver Nautilus Book Award for Children's picture books - fiction. As the family grew, so did Ralphie’s capacity for love and the ways he expressed it. Through additions to the family, and losses, he remained both loving and loved until, as a grand old dog of sixteen, he touched the hearts of the whole neighborhood. Ralphie, Always Loved tells Ralphie’s story. It will reach deep into the corners of your heart, remind you of all that is good, and reaffirm your belief in the power of love to transform and uplift throughout life’s cycle of birth, growth, maturity and death. Warm, sensitive colored illustrations show Ralphie frolicking with his loving family, of East Indian origin, and enjoying his doggy life to the fullest. "Ralphie, Always Loved"...will bring so much love and light to the hearts of all its readers. The illustrations are adorable and the words are kind, loving and filled with emotion. [T]his reviewer believes Ralphie is a book that moves from the category of lovely to award-winning. It is a fact that the love, respect, admiration, and kindness dogs bring to our lives is something that goes beyond the norm; they are truly a gift from Heaven, and this author/illustrator team has put on paper what dog owners everywhere feel with all their hearts. If you're a dog lover (or know someone who is -- this is the Christmas season, after all), then you'll want to check out Andrea Yerramilli's children's book, RALPHIE, ALWAYS LOVED from About Something Good press. With charming illustrations by Samantha van Riet, this children's book is dedicated to the real Ralphie who inspired Yerramilli to write his story. Now Ralphie's memory will live with you as well. Bright colorful illustrations complement this story of Ralphie’s life. This would be a good book for a family preparing to adopt a dog. Dedicated to providing book reviews for MA librarians and the world. Ralphie touched the hearts of so many on Instagram and was a true testament to what pure love was. This book is heartfelt, heartbreaking, and hopeful. Ralphie's legacy lives on, as he inspires others to adopt, not shop. Dogs are family, and Ralphie will always be loved by his. This is a story for those who have loved and have been loved in return. It is a tale that teaches us when a dear friend passes on; there is unending inspiration and love left behind. Written in simplistic, beautiful prose accompanied by heart-warming illustrations, this story welcomes you in to experience the love of this family, as it grows to include their beloved pup Ralphie. Ralphie Always Loved illuminates a difficult topic for children in a way that consoles, enlightens, and mends your heart like nothing else could. A rare and valuable book for teachers and parents alike! The love between a dog and its family knows no bounds, as witnessed by Ralphie the ‘dogfather’ and the Yerramillis. Ralphie, Always Loved takes us on the journey of the unconditional love shared by a wonderful family and their beloved dog. May we all be fortunate enough to experience the kind of love seen here. A heart-warming tale of love, patience, wisdom, and the circle of life. It takes patience to love a puppy and wisdom to say goodbye to an old dog with grace. I was honored to know Ralphie and the author and heartened to see another aspect of their lives. The story of Ralphie Always Loved is a heart melting tale of a shelter dog's journey. Being a dog owner myself, I loved reading this sweet book. It will be meaningful to any family that loves their pet. Andrea writes from her own life experience and enormous heart. Ralphie offers an opportunity for young readers to make multiple connections with themselves and other books they have read. Any child who doesn't have a dog will want one after reading this sweet book! What a beautiful tribute to Ralphie! He will live forever in this book. I’m excited that kids reading Ralphie’s story will see that adopting a homeless dog is the way to go, and I hope that parents will use the book to teach their children to Adopt, don’t shop! Four paws up for the story of Ralphie! This tale of everlasting love proves that sometimes the dog we rescue ends up rescuing us. Ralphie’s story will make you smile and cheer and want to hug your own pup a little closer. Even though I had the privilege of knowing Ralphie, I fell in love all over again. This is a story of patience and understanding, of love given and love received. A beautiful book.